Tonight we celebrated Matt's birthday at Kicho, a traditional Japanese restaurant just off of Olgastraße in the central district (Mitte). We discovered the restaurant about a year ago in search of good sushi, and were pleased to find a menu full of other traditional Japanese dishes. Tonight was our third visit, but our first one since our trip to Japan back in January. We both had a fantastic meal, and agree that it was our best one at Kicho yet. 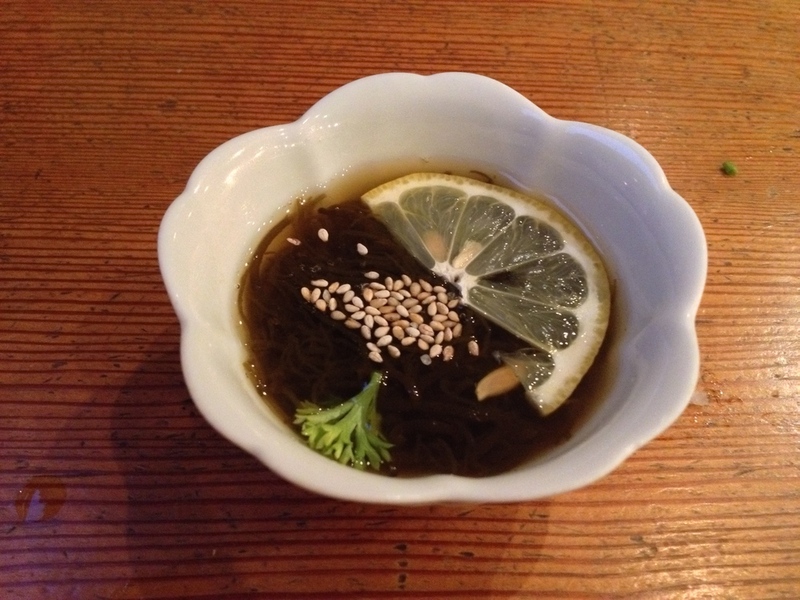 In fact, we agree that Kicho is probably the best Japanese food that we've had outside of Japan. Since we were celebrating Matt's birthday, we kind of went all out. Matt started with a hefeweizen and I began with a lychee sekt while we perused the menu. To start, Matt ordered the Tori-Karaage (deep-fried chicken), Yu-Tofu (boiled tofu with soy sauce), and Aburi-Hotate (scallops with a butter-ponzu sauce). The scallops were definitely my favorite of the three. The butter-ponzu sauce was so light and slightly creamy; it was the perfect pairing for the scallops. I also really liked the Karaage, which came with an unusual dipping spice of salt and macha (green tea) powder. We shared the appetizers, and then Matt got Syoyo-Rahmen (thin ramen noodles in a hot broth with pork) for his main. The broth was tasty, though the ramen noodles were, understandably, not as good as the ones we had on Tokyo's Ramen Street. Sadly, it has been rather hard for us to find decent ramen noodles in Germany. That's not to say that Kicho's ramen wasn't the next best thing; it's just that it's hard to train our taste buds after we've been so spoiled. For my meal, I predictably over-ordered and got the Tempura Course Menu. This was a seven course menu (for just 38€, which seems like a steal for the amount of food) made up of small dishes, including Dobin-Mushi (mushroom pot soup), Zensai-Mariawase (assorted appetizer of Japanese pickles, fish, and seaweed salad), Otsukuri (assorted sashimi), Yaki-Nasu (grilled eggplant), Sunomono (seaweed and cucumber in a vinegar sauce), Tempura (shrimp and vegetables), and Calpico-Mousse (a mousse made from a Japanese milk drink). Each course was beautifully presented and delightfully delicious. I don't remember the presentation being this good on my last two visits, though I think I only ordered sushi and a bento box the last two times. The stand-outs for this visit were definitely the mushroom soup and eggplant, which was served warm in a light sauce. I also love Japanese pickles, and certainly got my fill between the appetizers and entrée. The tempura was light and exactly how I remembered it from both the States and from Japan. The dessert was also delicious, and reminded me of a kind of tofu (but sweeter) that I had during a meal in Kyoto. It was so delectably creamy and gelatinous, that it melted in your mouth. The sashimi was probably the most disappointing. It wasn't bad, but certainly not as fresh as other sashimi that I've had. I would definitely like to go back again to try more of the sushi rolls, though I think I prefer Hiro's for that (review to come). 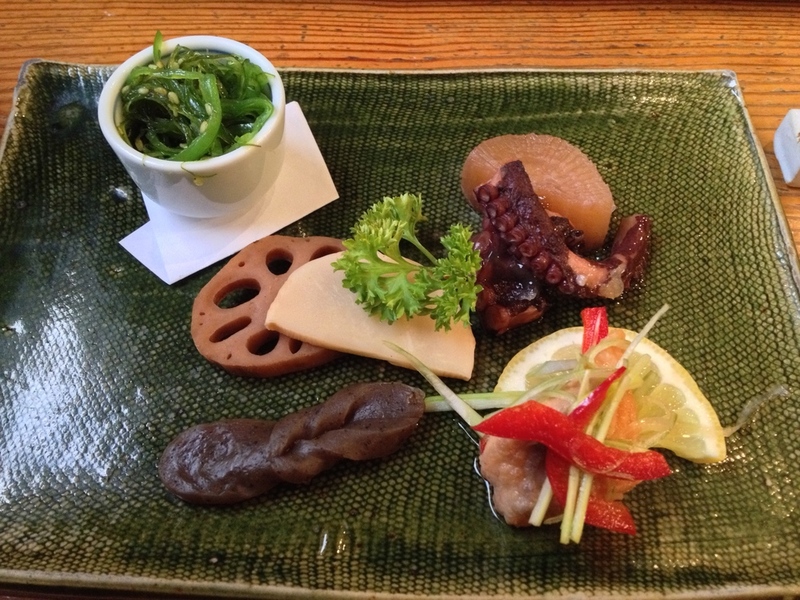 Really, I love Kicho because they excel at traditional Japanese food. The ironic thing is that most restaurants we encountered in Japan specialized in only one or two dishes. You would go to one restaurant for ramen, one for gyoza, another for sushi, and so on. It was uncommon to find all-in-one places (unless you were at an izakaya), though we supposed that this could in part be because given the difficulty of finding Japanese food in Stuttgart, it makes more sense to have it all in one location. For drinks, Matt switched to Asahi beer, and I had a sweet potato shōchū over ice. Shōchū is a kind of distilled liquor popular in Japan and for which I acquired a taste on our trip. Kicho had a nice selection of both shōchū and sake, and had three different bottled Japanese beers in addition to their large selection of western beer and wine. Kicho is located about five minutes down Olgastraße from the Olgaeck U-bahn stop. The restaurant itself has a lovely interior with tables wrapped around the sushi bar, and even traditional Japanese tables and pillows on tatami mats in the back room. I like that the décor was traditional without being kitschy. As a warning, know that once you enter the front door, you'll be in a tiny entryway with another, smaller door to your front. This door slides open in the traditional Japanese way, so don't try to push or pull it (as I did our first visit and nearly broke it). The service was great, as it has been every time we've gone, and I'm also pleased to hear the chefs and staff speaking Japanese. It's probably a logical fallacy, but it makes me feel more assured that the chefs know what they're doing. The wait staff spoke German to us the whole time per our preference, but offered to get us English menus and speak to us in English when we arrived. Kicho's website is available in both German and English, and you can book your table online through OpenTable, making your visit that much easier. All-in-all, we had another fantastic experience at Kicho that felt like it was a nice "Hello!" and "Miss you!" from Japan. To top off the evening, our waitress gave us a printed 10% off coupon for our next visit. Coupon or no, I'm sure we'll be back soon to taste more items on the menu.